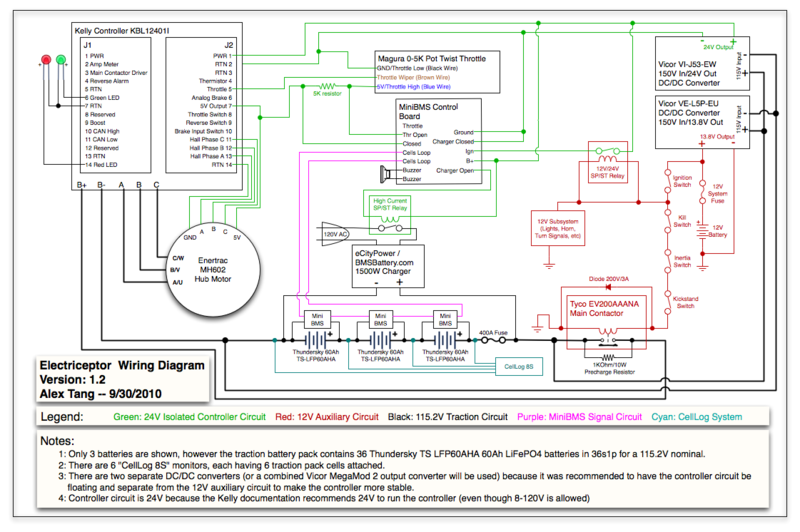 Thread: Show us your wiring diagrams! As blindspot suggested, here's a revival of this thread topic. I'll kick it off with my schematic. I already posted this in the thread on my build, but I'm surprised no one's caught any flaws yet, as I'm sure there are some that I've not yet found. Except for the oddly named grounds (-12V and -72V) which would actually indicated a 24 volt low voltage system and a 144 volt high voltage system, everything looks real good. What program did you use for the schematic? James May - "It's an ingenious solution to a problem that should never have existed in the first place!" BillMi - "Holy Cats! .... (it's) a death trap with extra killing sauce." Teresa Dillard - "I can't believe you (Ted) killed a Prius." My only question is the power draw across the 1K resistor before you energize the contactor. With all the stuff on the 72V line trying to run, before the conatctor is closed, aren't you going to have a couple problems? DC/DC will be trying to start, Power analyzer will be trying to start, and controller will start. With this big of a load it will quickly pull that voltage down until one or more shuts down but the resistor will heat up quickly. Take another look at your circuit keeping in mind that the resistor is just to equalize the capacitors in the controller and then do nothing. It shouldn't be powering things before you want them on. Kelly's circut that they recomend puts a seperate switch to the controller (not through the contactor) and I'm reasoning that is so the controller is not actually on when you are equalizing the capacitors in it. What program did you use for the schematic? Thoguh, i'm with sean on this one. What program did you use? Except for the oddly named grounds (-12V and -72V) which would actually indicated a 24 volt low voltage system and a 144 volt high voltage system, everything looks real good. Good point. I suppose "Input -" and "Output -" would be more appropriate. My only question is the power draw across the 1K resistor before you energize the contactor. With all the stuff on the 72V line trying to run, before the conatctor is closed, aren't you going to have a couple problems?.... Kelly's circut that they recomend puts a seperate switch to the controller (not through the contactor) and I'm reasoning that is so the controller is not actually on when you are equalizing the capacitors in it. That makes sense. I picked up a 12v coil contactor without looking over Kelly's circuit closely, but I e-mailed Kelly asking if that would be a problem - if there was a safety reason that the contactor coil needed to go through the controller to get to pack negative, like an emergency shut-off, and they said no, running it 12v was fine. Looks like I'll need to add another, low amperage 72v load, 12v coil relay in for the other 72v items. I'm thinking a 12v relay also might be in order, so the amperage of the headlight and other 12v accessories isn't being drawn through the keyswitch. That's standard on ICE motorcycles, but I'm not sure how much is due to limited capacity of the keyswitch or because there's a circuit the shuts off the headlight when the starting, so the full power of the battery can be devoted to the starting motor. i'm with sean on this one. What program did you use? Adobe Illustrator. Open Office Draw which is free, though (openoffice.org) should be equally capable for this kind of thing. Thanks Bill, this was the kick in the pants i needed to work on and do my diagram. I'm attaching it below. I'm sure there's stuff i've missed or that's just flat out wrong, so let me know! And of course, as of right now, i have 0% of it actually completed. 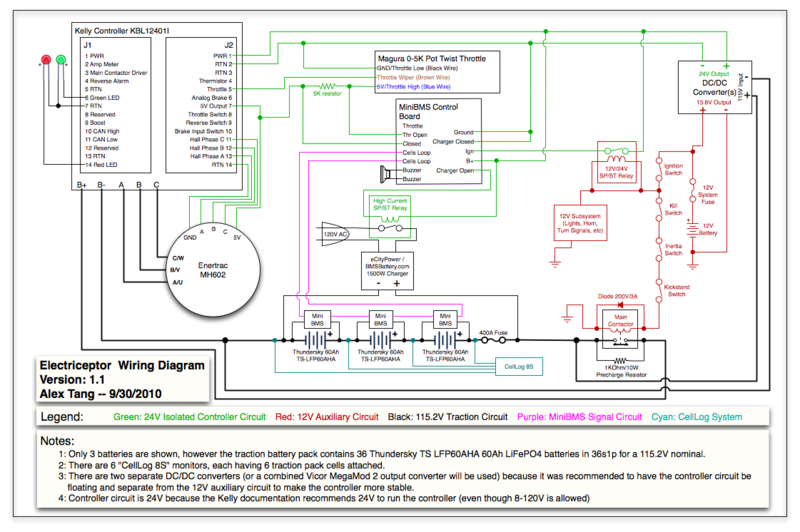 PS, if anyone is wondering, I ended up using OmniGraffle for Mac to make this diagram. Last edited by __Tango; 29 September 2010 at 2352. Reason: Attaching original since elmoto shrank the schematic. Nicely Drawn, Tango. Hopefully we'll get folks re-posting too, there used to be quite a few schematics posted, and at least for me, seeing more examples, stimulates the thinking. 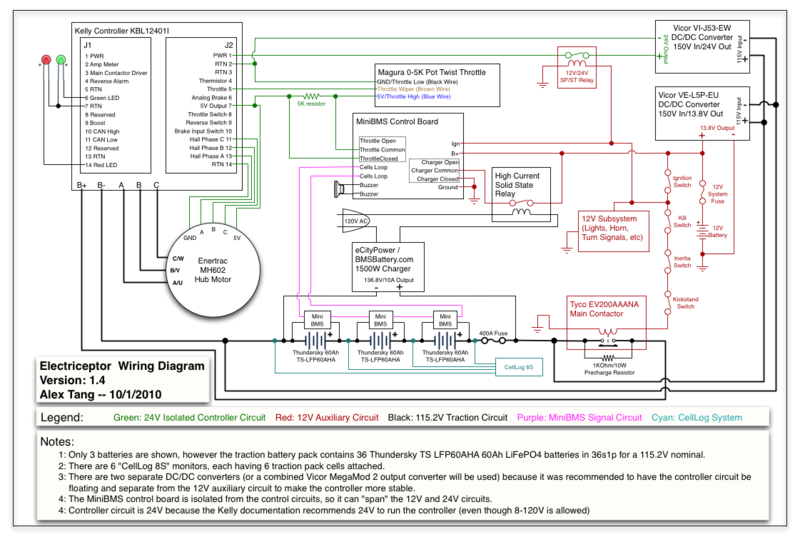 Interesting take on the 24 and 12v systems. I'd considered (and still am considering) simplifying things with a constant-running DC-DC set-up like that, to eliminate the 12v battery but still have power going for the MiniBMS. On the pro side, it's hauling less around and simpler in design, but on the con side, I see this situation in my head where I can't ride for a while and it drains the batteries - which should take practically forever, but it's a nagging what-if in my head. Interesting take on the 24 and 12v systems. I'd considered (and still am considering) simplifying things with a constant-running DC-DC set-up like that, to eliminate the 12v battery but still have power going for the MiniBMS. Yeah, the main reason i split them into two systems was that there was a thread on the old board where markcycle from enertrac said that the kelly controller works better if it's on its own isolated circuit and not on the same grounded circuit as the rest of the 12V stuff. Since i was going to do a separate circuit for the controller anyway, the Kelly documentation says that 24V is preferred, so i went with a 24V circuit. One thing i'm not sure about is if the MiniBMS control board will be happy with 24V vs. the standard 12V. I've sent mail to Dimitri (the maker of the MiniBMS) to ask. I haven't heard back yet. There aren't any major changes, just separated the converters out since i now have acquired the second converter (vs. getting a new combined converter). And BTW, let's see some other ones too! The MiniBMS control board would fry if it ran on the 24V circuit. I originally had it on the 24V circuit because i didn't want it to ground the 24V circuit (the issue with the kelly not wanting to be on the circuit with the rest of the 12V system). However, it turns out that the MiniBMS control board is isolated iteslf, so the B+ and Ign can be hooked up to the 12V line and it won't cause problems. The relay that spans the 12V and 24V circuits was drawn so both coil contacts were on the same line. One needed to go to ground. I also noticed myself that the relay that spans the The power input on the controller was "always on". It needed to be run off the line that comes off of the pole of the relay that spans the 12V and 24V circuits. He said the tyco contactors have builtin diodes, so there was no need for an external one. E_Cruise.jpg Quik copy that needs lots of work, but will give you an idea anyway. All times are GMT -7. The time now is 1104.